Oh my lordy lordy LORD. I have known these two weeks were coming, but it’s still a shock that they’re here already. As you might know from my #shamelesswhoring on Twitter, I have a book out this week. Tonight I am at the Royal Festival Hall, the evening being relayed live to 60 cinemas across the country. 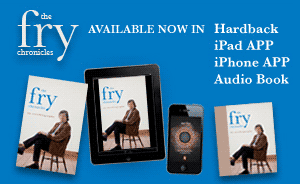 I have been splayed over newspapers and the Radio Times in various undignified poses and to top it all the Dave Channel are, bless them, having a Stephen Fry Week. Over the coming fortnight I am doing evenings in Norwich, Cambridge and Oxford. There are three live performances at the Royal Albert Hall and further events at Cheltenham and Bath to come. Throw in on top of this the usual swathe of One Show, breakfast TV interviews and suchlike and you have a savage lubeless media assault that may well bring tears to the eyes. I shan’t burden you with too much gloopy English self-flagellating false modesty, but I will certainly understand if you already feel that you’ve had your fill of Fry. These publicity blitzes are all very distressing to persons of tone and sensitivity and you won’t be blamed for pulling up the duvet and waiting for the unpleasantness to pass. You may wonder how I feel in all this. Do I feel elated? Self-important? Proud? Ashamed? Wind-tossed? Grandiose? Impotent? Slutty? Vain? I don’t know how, from your point of view, you might imagine I feel with such a full-on fortnight ahead so I shall try and examine my feelings and share them. There is an element of excitement for me, certainly. I don’t think the idea of relaying a live evening to so many cinemas just for a book publishing event has been tried before. I always love new modes and methods. I like the fact that there are more formats of eBook, iBook, audiobook, App and traditional paper and ink than ever before. All that is pleasing and exciting. It is exciting too to be talking to and meeting so many people in so many different ways, live on stage, in signings, through the mass media. After four months of sitting in a study staring at the screen in a solitary state it is always miraculous finally to see a book in print and to engage with people who are reading/have read or are about to read the thing one struggled with in lonely despair for so long. I cannot deny that I am nervous. Nervous about the inevitable … what is the word? …. not backlash exactly, but, well, humans wouldn’t be human if they didn’t want to slap someone like me down. I know I would if I saw me popping up all over the place like this. It is inevitable that in interview I will repeat myself and that a particular observation or turn of phrase I come out with on the One Show will be heard again on Chris Moyles and read once more in some magazine, and people will think me cheap and lazy. I will get very down if I accidentally read something snide and unpleasant, no matter how many times I comfort myself with all the usual nostrums – “It’s tomorrow’s fish and chips”, “no one pays attention” and so on. That’s just me and while I should be used to it by now, I wish I had some of the pachydermous indifference to criticism and unkindness possessed by others I know. The most important thing is not even to think of self-pity or rawness or to succumb to vulnerable fits of super-sensitivity. I have to remind myself that it is a privilege and a wonder to be presented with such opportunities to address and meet so many people, to be propelled through such a life and to be accorded such experiences. You may think it supremely unnecessary to have to remind myself of so obvious a truth. Perhaps this is one of the real dangers of life in the celebrity lane: it is human nature to accustom yourself to most things – poverty, riches, popularity, loneliness and all kinds of states in between. Most of you reading this are very very lucky. After all you’ve got a computer, or a mobile phone, the knowledge and the opportunity to use it and the ability to read. We’re all fantastically lucky, but I cannot deny that I am luckier than most and I do know that it is something close to a crime to forget it or to whine. 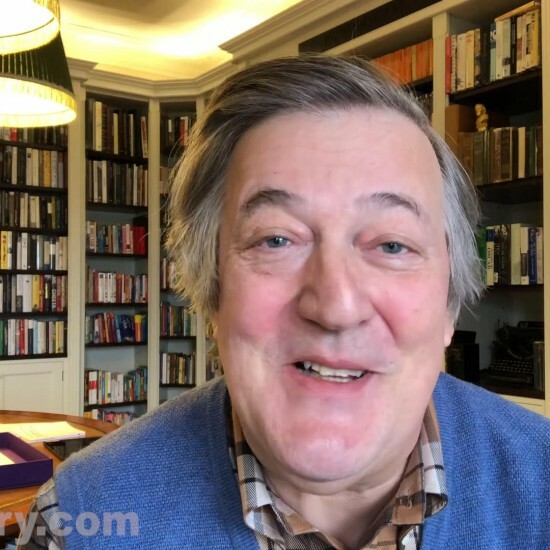 So, apologies if my presence is becoming all too much – I shall do my best to hide when Penguin’s publicity push is over – a new series of QI running for another 15 weeks notwithstanding. And if you are one of those who is kind enough to buy the book or to attend one of the events, thank you. If you are one who is annoyed that my tour has stayed so resolutely to the south of England and the metropolis, apologies … I will try and put that right next year. If you are annoyed because you can’t find the app or ebook in your local American or other store it is because of copyright laws. The book is published in the UK, Australia, New Zealand, Canada and other English speaking territories, but not the US. That’s not my law, I’m afraid, but somebody else’s!